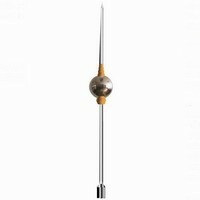 - Sphere single lightning rods, used for protection all kinds of building from direct lightning. - main material is stainless steel, acid-proof and rust-proof. - Strong Wind bearing ability. - Special design, with decorative function for buildings. Lightning rods protection zone should be calculated according to standard stipulated rolling sphere method. If the lightning conductor does not meet the requirement, it can adopt special rail or tower to increase the height; if the protection area is wide, it can consider to using several lightning conductors to cover protection area. Firstly, install the assembled lightning rod on the top of the building (fixed the lightning rod with the building by the four ∮10mm hold of the flange, please refer to the drawing of flange). Using Zinc bonded flat steel 40mm×4mm or round steel ∮12mm as down conductor, which should be welded to the flange from grounding electrode by means of direct road. The down conductor should be attaching to the building (the outer side of the wall), and be fixed to the wall of interval 1.5m. In the end, the welded part should be painted by rust-proof material.